Our most famous line of aluminium boxes, available in either silver anodised or black powder-coated finish. This unique method of housing dry flies in individual compartments, each with its own spring-loaded window, gives a safe and reliable way of storage. Our Rolls Royce of dry fly boxes, the 1609, has compartments in both lid and base. The rest of the compartment range are combined dry/wet fly boxes and have compartments in the base and either clips or flat foam in the lid. Size in inches: 31/2 " x 2 3/4 " x 1"
Size in inches: 3 1/2 " x 2 3/8 " x 1"
Black - aluminium box. 6 compartments. Foam in lid. 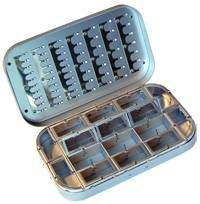 Size in inches: 4 3/4 " x 3 1/2 " x 1 1/8"
Silver - 2 large & 8 small compartments, foam in lid. Black - aluminium box. 12 compartments. Foam in lid. Silver - 6 large & 4 small compartments. Small 7s & 10s clips in lid for 58 flies. Size in inches: 6 " x 3 1/2 " x 1 1/8"
Silver - 6 large & 4 small compartments, foam in lid. Black - Aluminium box. 6 large & 4 small compartments. Foam in lid. Size in inches: 6" x 3 1/2 " x 1 1/8"